﻿ The Modern Lobster Trap Turns 35 - Anping County Zhuoda Hardware Mesh Co., Ltd.
Riverdale Mills revolutionized the lobster fishing industry when founder James Knott, Sr. created Aquamesh, a first of its kind marine-grade welded wire mesh fabric designed specifically to create a more durable lobster trap for New England lobstermen. Thirty-five years later, over 80% of all lobster traps in the U.S. are built with Aquamesh. A native New Englander, Mr. Knott envisioned a lighter and more durable trap made of wire but knew when exposed to the environment, steel, like nearly all metals, will corrode. Knott worked for years to create a manufacturing process and coating system that would protect the wire lobster traps from the harsh sea environment. Ultimately he developed a two-step method to ensure the longevity and durability of the traps: continuously galvanize long rolls of welded mesh, referred to as galvanize after welding (GAW), then follow with a PVC coating process to protect the wire mesh from the extreme sub-sea conditions of the Atlantic Ocean. He named the lobster trap wire mesh product Aquamesh. In 1980, Knott delivered the first shipment of Aquamesh to Maine – home to the largest lobster fishery in the world. 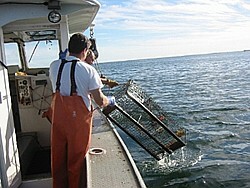 Aquamesh is considered the worldwide industry standard for the construction of lobster traps. In 2014, over 150 million pounds of lobster were caught along the U.S. and Canadian coastlines, the economic impact estimated at approximately five billion dollars. "On the occasion of our company's 35th anniversary and the introduction of Aquamesh, Riverdale Mills thanks and acknowledges the hardworking and dedicated men and women of the lobster fishing industry," said Riverdale CEO Jim Knott, Jr. "We are honored to be a part of this dynamic industry and remain committed to delivering products of unsurpassed quality to lobster fishermen worldwide." For 35 years, lobster traps made with Aquamesh have withstood some of the world's most severe weather. The galvanizing process is the key to its durability. Galvanization provides a protective zinc coating that retards rust. If zinc is applied to wire strands before they are welded together (GBW), the wire junctures lose their galvanized protection. When zinc is applied after welding (using GAW), lobster traps typically last four to five times longer than traps made using the GBW process. Aquamesh is still manufactured in a former textile and paper mill in Northbridge, MA (USA) that Knott purchased and renovated in 1979. In addition to Aquamesh, Riverdale's high security WireWall™ fencing product is virtually impossible to climb or cut; it is used by numerous American prisons, protects Kuwait's border with Iraq and provides miles of security fencing on the U.S./Mexican border. The company also manufactures products for infrastructure and transportation products, gabions/bastions for construction, and mesh products for the poultry, farming and forestry industries. Riverdale Mills Corporation is one of the largest manufacturers of galvanized and PVC coated welded wire mesh in the world. A privately held company based in Northbridge, MA, Riverdale Mills specializes in the design and manufacturing of commercial, industrial and consumer wire products, tools and accessories for the marine, aquaculture, security, construction and farming industries. The company's exemplary quality and manufacturing expertise is known worldwide. Riverdale Mills is the inventor of Aquamesh® -- the industry standard material for lobster traps.